For years, world renowned naturopathic doctor, Dr Nigma Talib, has been solving skin problems and answering the million dollar question, ‘what can I do to look and feel younger?’ From every day patients with chronic skin conditions such as acne and psoriasis, to high profile names who need to look picture-perfect on the red carpet, Nigma has seen the powerful results of her inside-out approach that starts with the gut. Now, for the first time, she shares the secrets to youthful-looking skin in her complete, 360-degree guide that everyone can adopt into their everyday life and enjoy. This is not just an anti-ageing plan. This is a new life plan. We can’t stop the clock, but we can tip the scales in our favour. 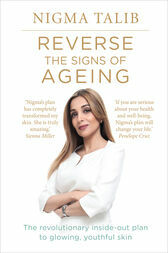 "Dr Nigma's book is pioneering the real solution to ageing gracefully. It is a must read for anyone wanting to look and feel their best at any age." Nigma regularly appears in the national press as a leading authority on skincare issues and holistic health. She is recognised by the prestigious who’s who publication Princeton Global, is listed on Vanity Fair’s Who To Know list and W Magazine named her the Beauty Guru.